Safety is our core value. We are committed to provide a safe and healthy workplace for all our stakeholders. 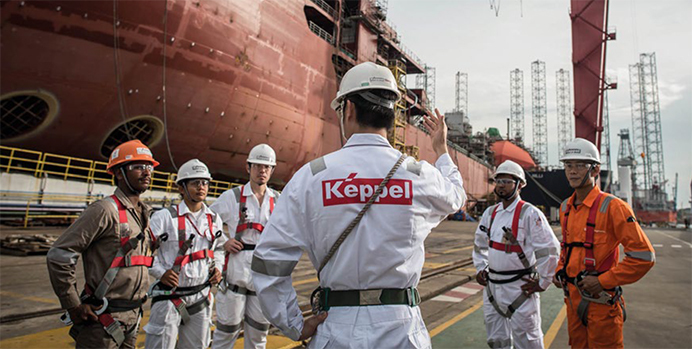 The Keppel Corporation Board Safety Committee (BSC), supported by the Inter‑Strategic Business Unit Safety Committee, leads efforts to formulate strategies, implement initiatives and improve safety performance. At the annual Keppel Leadership Health, Safety and Environment (HSE) Roundtable, senior management shared insights and exchanged ideas on improving Keppel’s safety performance. The action plan generated during the session was incorporated into the Group’s safety roadmap. We empower and train our stakeholders to ensure that they are kept updated on safety measures and best practices. Training programmes are regularly reviewed and improved to equip all personnel, from workers to frontline supervisors, with the competence to handle any situation with confidence. To further strengthen the Group’s safety culture and achieve our shared safety aspirations, we have begun to harmonise and align safety standards for High Impact Risk Activities across our global operations. The Keppel Group Safety Convention in 2016 saw the continuation of the Keppel Group Safety Awards, which recognises employees who have gone the extra mile to foster safe and healthy work environments. Employees across the Group continue to develop innovative solutions to improve work processes and enhance safety in their daily work. In 2016, a total of 53 Safety Innovation Teams submitted Safety Innovation Projects – practical solutions to address safety challenges on the ground. Three Platinum, Five Gold, 12 Silver and 15 Bronze Awards were presented to the winning teams. Despite our arduous efforts, we suffered seven fatalities globally in 2016. We are saddened by the loss of our colleagues and have thoroughly investigated the causes, stepped up efforts to prevent recurrences and shared the lessons learnt across the Group. Every incident is preventable. The Group places emphasis on the effective dissemination of lessons learnt globally through the Group HSE Alerts system. Efforts to inculcate safety consciousness include the sharing of best practices through campaigns, newsletters and animations. The Group was conferred 35 awards at the Workplace Safety and Health (WSH) Awards 2016, organised by Singapore’s Ministry of Manpower (MOM) and the WSH Council. This is the largest number of awards won by a single organisation in Singapore. We work closely with all stakeholders, including our contractors and subcontractors, to maintain high safety standards throughout our workforce. Our subcontract workers undergo the same safety training as direct employees. To raise industry standards, we work closely with MOM and the WSH Council to roll out safety initiatives and to encourage our subcontractors to equip themselves with relevant safety certifications from the WSH Council. The Keppel Group has also been a regular sponsor of annual national safety events, including the 2016 editions of the WSH Conference, National WSH Campaign and bizSAFE Convention. HSE is an integral part of our business. HSE is a line responsibility. Everyone is empowered to stop any unsafe work. A strong safety culture is achieved through teamwork. Regular safety briefings are conducted by our frontline supervisors to inculcate a strong safety mindset among our employees and subcontractors.